My change-purse flush with cash. The largest bills are the 10,000 shilling bill which is about $6.50, so you wind up with a very thick wallet after every visit to the ATM. savings and went for it. I tried to book my ticket for Air Excel online, and wound up in their office when the transaction refused to go through online. The staff was very friendly, and very helpful, but there were a few other glitches in the process. After a little over an hour in their office, and after trying several credit cards that refused to go through (computer issues, not my available credit, to be clear!) 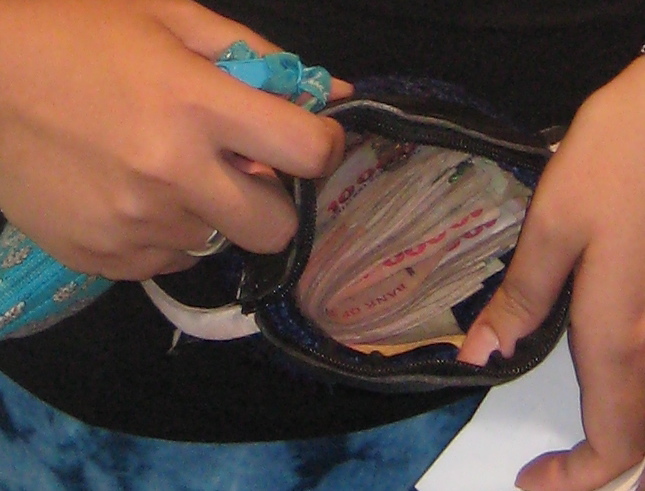 I wound up paying cash – thankfully I had just taken some out of the ATM, as has become my custom in Africa since very few places even accept credit cards, and, as this experience proved, even the places that do can’t always successfully process the transactions. But finally, after they were able to confirm that the flight was actually going to leave on Wednesday (it was Monday when I booked it) and that it wasn’t already full, they were able to sell me a ticket. I realized later that them talking about whether or not there was a seat available was really a cover for them deciding whether or not the flight would take off with only two passengers, as there was only one other woman on the flight with me! 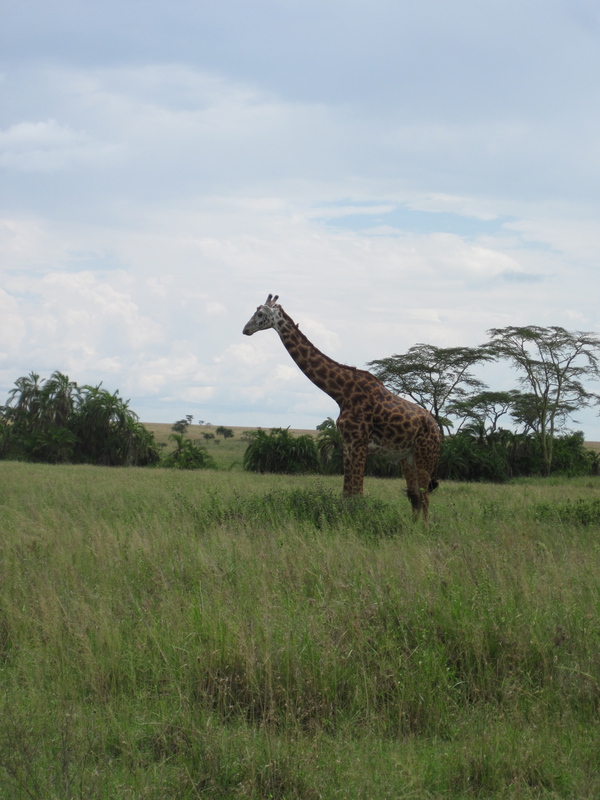 But no matter, the other woman, Mike (our pilot), and I were off to the Serengeti! I was glued to the window, looking at the scenery, the beautiful rolling green hills and Maasai villages I could see along the way, and my excitement was building the whole time. 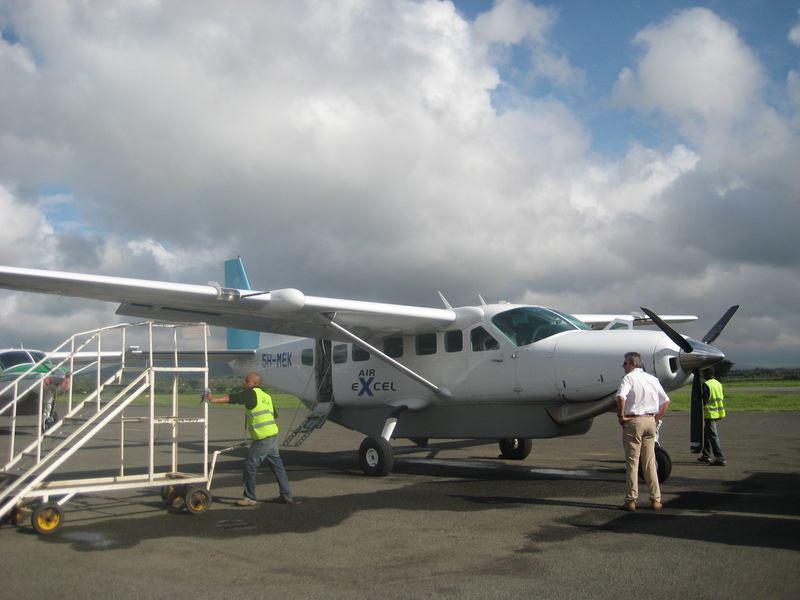 After the quick 1 hour ride, we were landing in Seronera, and any concerns I may have had about the ability of the driver who had been sent to find me were immediately laid to rest when I saw exactly how tiny this little airport was. Seronera airport is really just a dirt airstrip and single small building with a few parking spots. It’s without a doubt the smallest airport I have ever been to. But it’s all that’s needed, really, as I don’t think too many big flights ever come there. My driver immediately greeted me at the plane, having done well with his 50/50 shot to identify me amongst the passengers. He went to the counter at the one building there, and picked up my park pass. We climbed into his Land Cruiser and we were off! We immediately went out on a game drive, as checking into my hotel could clearly wait, and I didn’t want to wait to see the animals! Already the little birds that were hopping around the airport were colorful and cute, so I was ready & eager to see the wildlife! I thought I had seen some elephants from the window of the plane, so I was pumped and ready to see more! We drove down the road and I really didn’t have to wait long to see some animals. 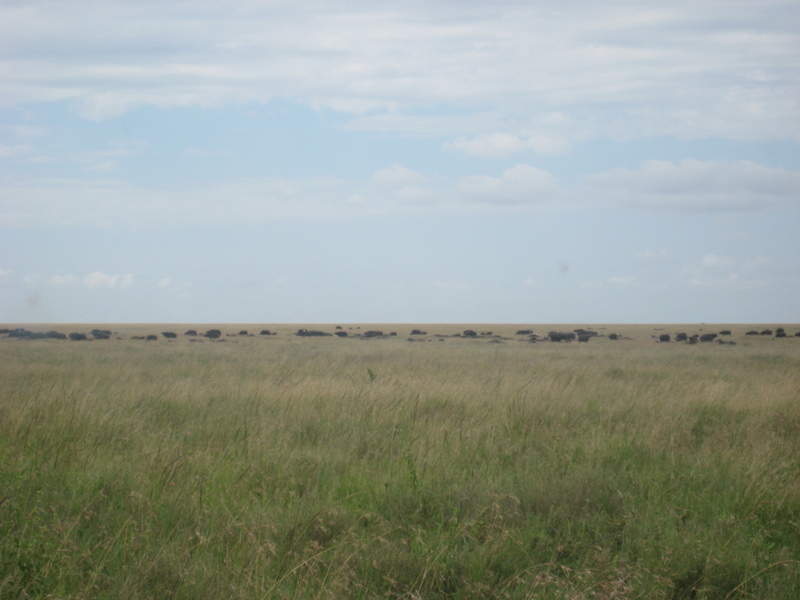 The first ones we saw were the buffalo, and there really were a lot of them!! Now, maybe my standards are too high, but I have to say I didn’t get too excited about the buffalo. They’re cool and all, but they just don’t have the same wow factor as some of the other animals I was hoping to see. Plus, they weren’t super-close to us, which is probably good since they are pretty dangerous, but still, doesn’t make for the most exciting animal experience. 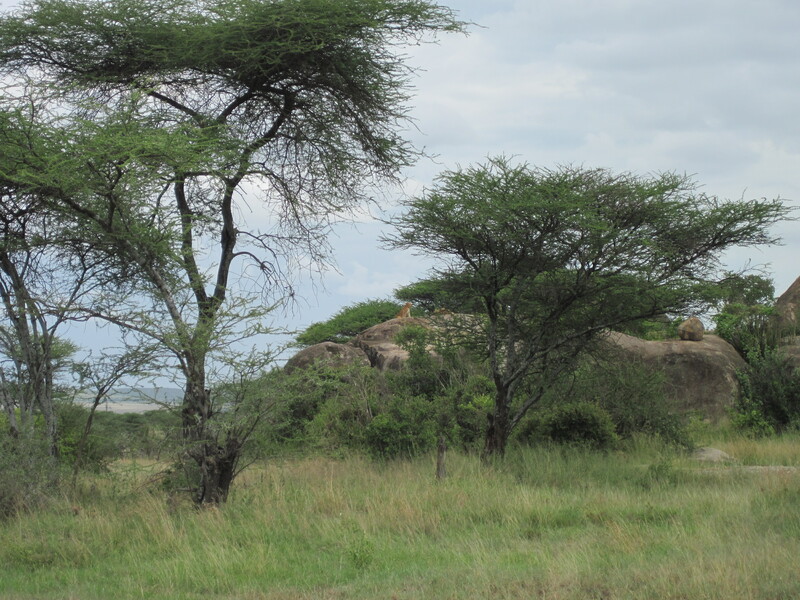 Not to worry though, because shortly after we saw the buffalo, we came upon some rocks, upon which a pride of lions was lazing around!! 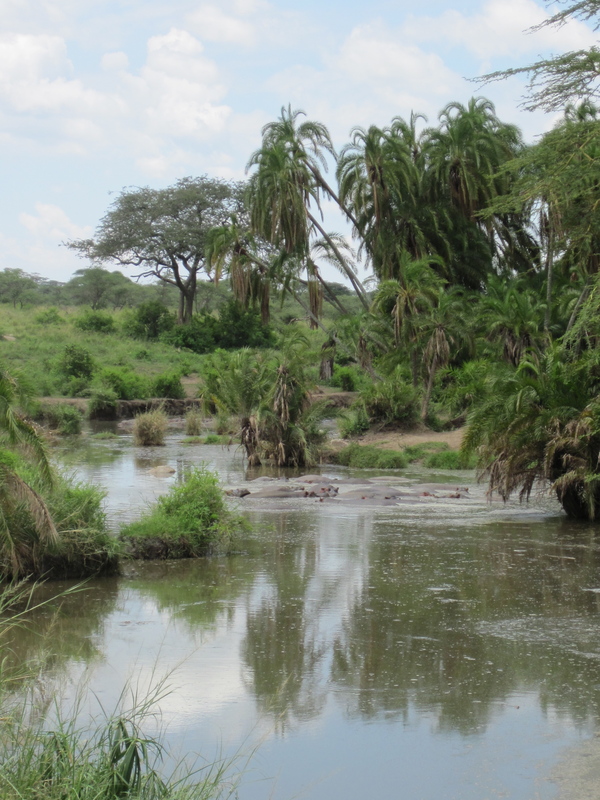 It’s pretty hot in the Serengeti at this time of year (despite it being rainy season), so having arrived in the morning around 10am, it was starting to get quite warm. Around noon into the early afternoon is the hottest part of the day, as almost anywhere else, so I had hoped that the animals wouldn’t be feeling too hot & lazy, but no luck. Even a passing hyena did very little to make the lions react. 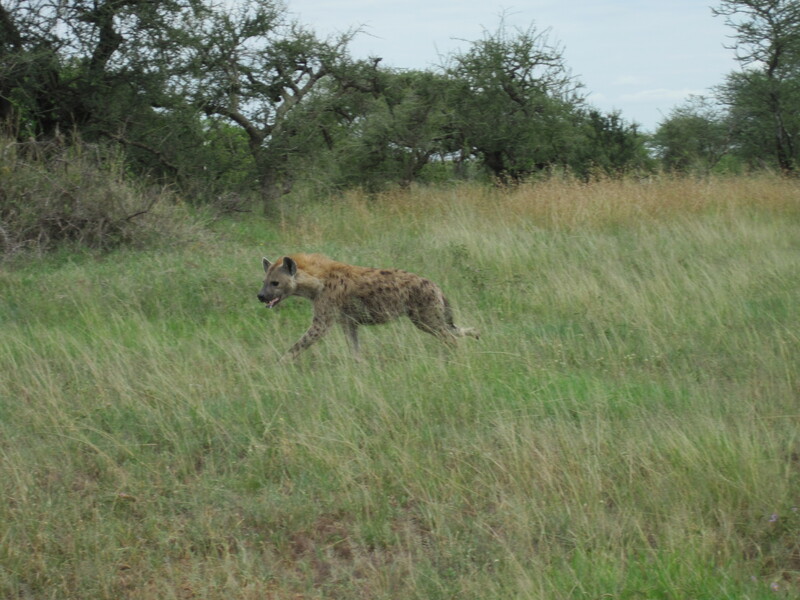 The hyena trotted down the road towards our car, then veered around us towards the rocks before moving along away from the pride of lions. One lion sat up and watched as he passed, but that was about all of the enthusiasm he could muster. Hyenas. Proving every day that nature has a sense of humor. What an awkward looking creature! Vervet monkey - so cute!!! After the hyena passed us by, we soon tired of watching the lions just lay there, and we moved on soon thereafter, with me hoping that we’d have another more exciting lion encounter later on in my safari adventures. 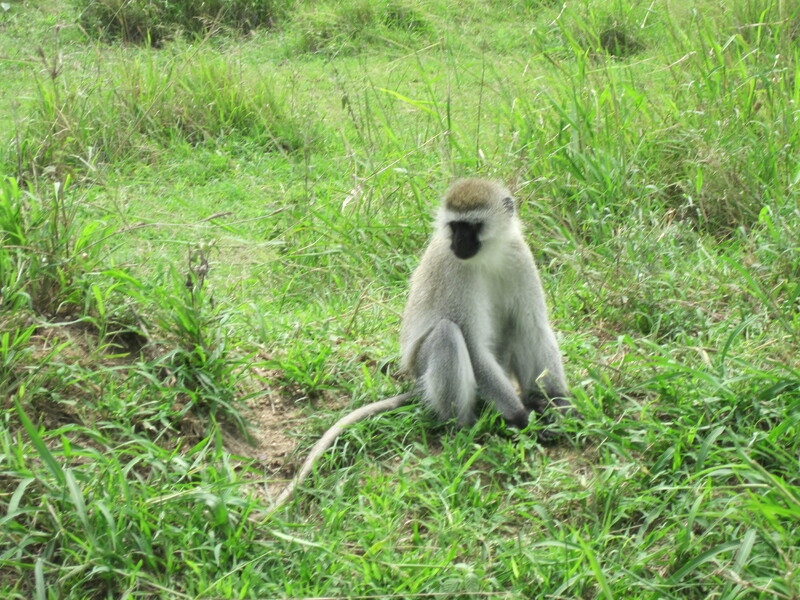 We came across some Vervet monkeys along the side of the road, and they paid us absolutely no mind, as we pulled up next to them and I started to snap some pictures out of the open window. They didn’t even look at us! They just kept on picking at stuff on the ground and being cute, and eventually we pulled away. A short way further down the road we came across another primate, and this one seemed to be just as curious about us as we were about him. The Olive Baboon stared us down, and kept pace with the car (the driver was going slowly to keep him in sight) for quite some time. 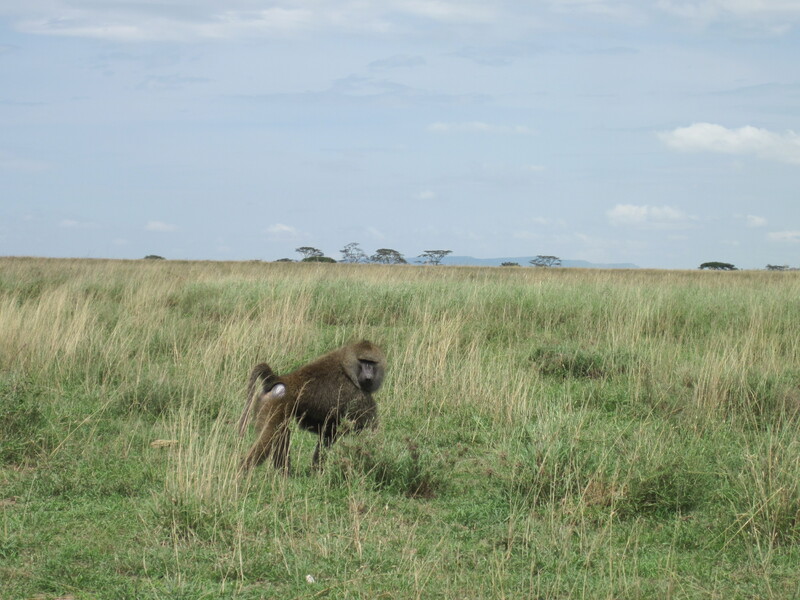 I noted a slight hint of aggression from the baboon, and found his stare somewhat unnerving. I know from previous travels in South Africa that some species of baboon can be quite aggressive towards humans, and though this one didn’t seem to be anything more than slightly vexed by our watching him, he certainly didn’t feel particularly friendly. Of all the monkey family, I have to say, I think baboons are not my favorites by far. Perhaps I just haven’t understood them well enough yet, or haven’t seen enough of them or something, but something about them intimidates me a little. While I’d love to have an up-close encounter with a gorilla or one of those adorable vervet monkeys, I think I’d find anything closer than this encounter with a baboon somewhat unsettling. For now, I was entirely content to be in a vehicle, and not allowed to get out!! 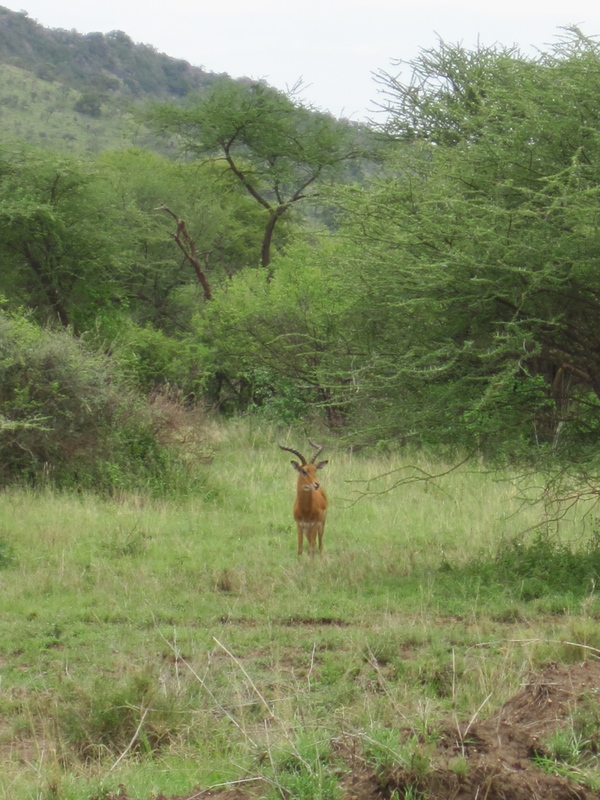 After the hippos, we still saw even more animals on the way back to the Serena Serengeti Safari Lodge!! 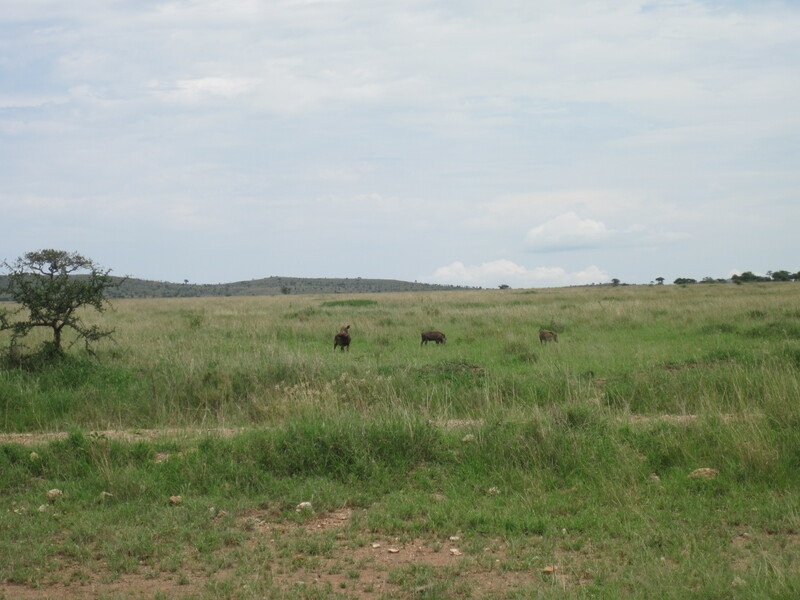 Next came the warthogs (Pumba! 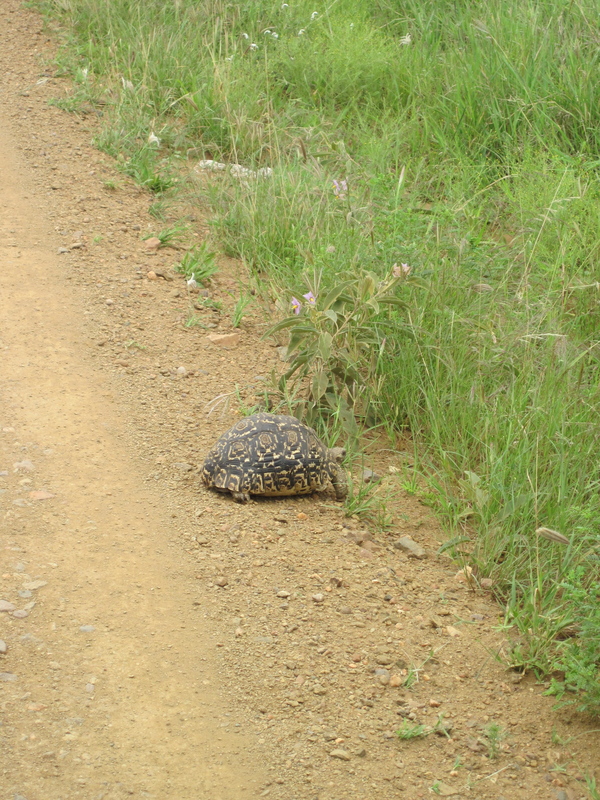 ), followed by the Impalas, and then a super-cool looking tortoise. By the time I got to the Lodge, I was hungry, as it was time for a late lunch, but my desire to see some wildlife was definitely sated for the day. I checked into my room, and the hotel was deserted. It is the beginning of the rainy season (see my post about the wonderful thunderstorm I experienced here), so it’s low tourist season. This was good for me, as I liked having the place to myself. There were 3 other people having lunch at the same time as I was, and it turned out that they were all Canadians, who had attended the same university as me, and had similar travel plans. 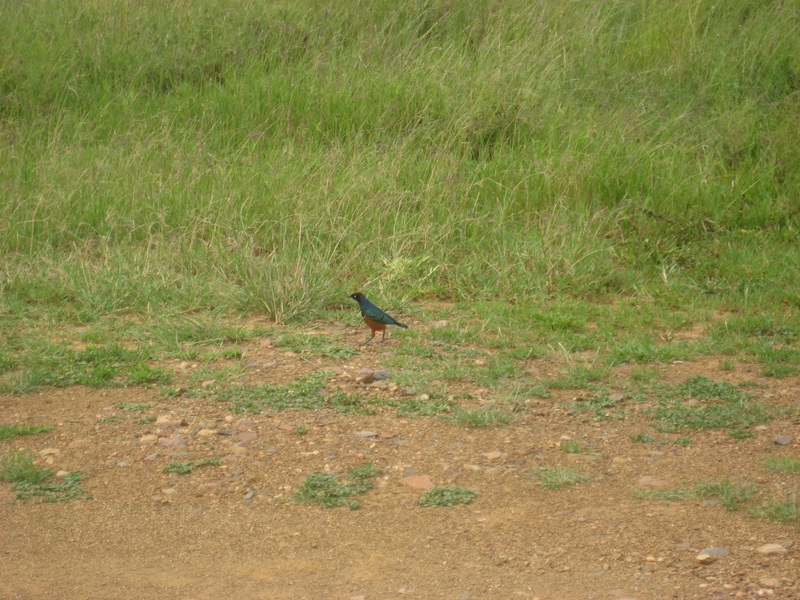 I ran into them again at my next hotel, the Ngorongoro Farm House a couple of days later. We chatted a little, and then I went back to my Maasai-style bungalow for a little relaxed reading. 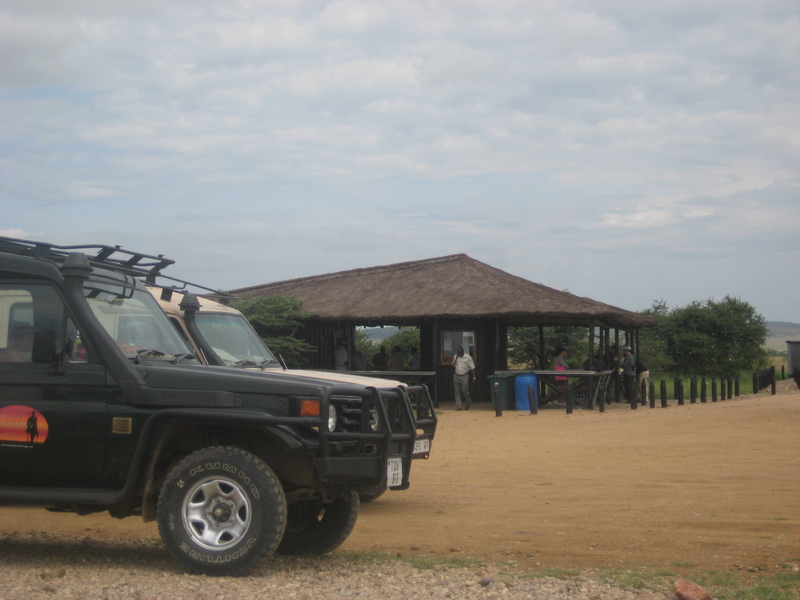 I booked a guided nature walk for the next afternoon (everything is guided as the Serena Lodge is in the park, and wild animals frequently enter the property – they even make you get a security guard to walk you to and from dinner! ), and planned to enjoy having the pool to myself the next morning. A couple of solo-days in the Serengeti were just what the doctor ordered, so I settled in to enjoy myself with a quiet day and a half before taking a game drive from Serengeti to the Ngorongoro Conservation Area, where I would meet up with my friends again.